The last unit I’m introducing in upcoming release. The Sparrow was a the main Alliance Fighter/Bomber until the development of the superior Harrier. Originally designed to be small and carried underneath long range bombers, however the idea was scrapped, but sparrows were still deployed as the main fighter of the Alliance for 30 years. 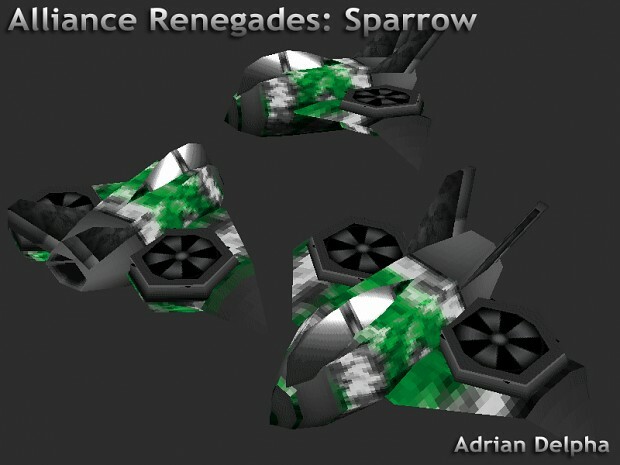 The Renegades stole many unused Sparrows in their defection from the Alliance. Due to their relatively low numbers the Renegades only deploy them in must have situations. They are armed with 2 forward nose guns for air to air combat, and a small payload of bombs for ground targets. As the Sparrow is an outdated aircraft it is outclassed in air to air combat by fighters from the other factions. Despite this Sparrows can prove useful in tactical bombings of base defenses, harvesters, and light vehicle formations, as well as hunting down gunships. A squad of sparrows can overcome the more modern jets if good tactics are used. Note: the Sparrow is notably smaller than most air vehicles. To be able to produce a Sparrow you first must get the “Call for Air Support” upgrade at the Satellite Uplink Structure.